Eric & Christopher are two artists who have been working together hand printing their own photography on pillows, totes and canvases. 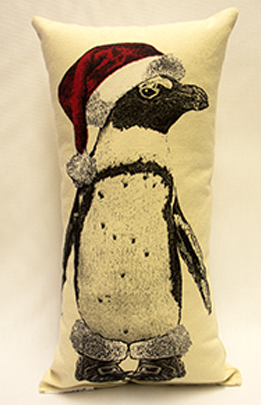 Christmas, Santa Penguin, North Pole pillows. 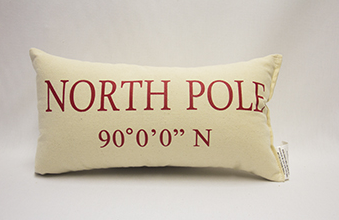 What fun pillows to have around the holidays in your living/family/den room or your bedrooms. Festive, clean, crisp designs. 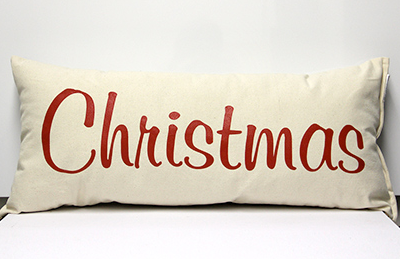 All pillows are hand screen printed and sewn in Bucks County, PA. of 100% Natural Cotton Canvas with hypo-allergenic polyester fill. Pillows measures approximately 8" w x 15" l and 12" h x 26" w.
2 small and 1 large pillows. These products can be shipped worldwide. Eric Fausnacht was born in Pennsylvania. He received a Bachelors of Science in Art Education from Millersville University of Pennsylvania in 1992 and continued his education at The University of the Arts, Philadelphia, and the Pennsylvania Academy of Fine Arts. During this time he began an interest in the study of the strength and textures of birds, especially domestic fowl. Eric is an award winning, exhibiting artist who shows his original works of art both locally (Bucks County, PA) and nationally. Christopher Kline was born in Bermuda, but has spent most of his time growing up in Bucks County, PA. He started a screen printing business "Kanika" while in high school (1989) and continues to own and operate the business today. He is also an award winning artist showing original oil paintings around the Bucks County area. Eric and Christopher met while participating in an art show outside of Philadelphia, PA. At the show Chris introduced Eric to a new art project he was developing titled "Push Pull Print" (2011). The show would invite 20 artists who were not screen print artists to convert their works into screen prints with his help. Upon completion, all the participating artists would showcase their finished pieces in a show. Eric accepted the challenge and through the process Chris and Eric were able to talk about their art and their businesses. Shortly after the completion of the second Push Pull Print project Eric had come up with the idea to put his images on to pillows. 2012 is when "Eric and Christopher" started printing and manufacturing. Through Eric's network of art shows and attending their first wholesale show together they sold over 1,000 pillows in their first 6 months. Chris takes the image and preps it for its journey to be hand screen printed. Upon completing the screen print process the images and fabric swatches are then sewn by Eric, getting them ready to insert the pillow blanks. When they started Eric and Christopher their goal was to enjoy their creative talents that they both have while bringing something to their clients that could easily engage them and was affordable. Something they both could take part in making, working together and sharing ideas. Their pillows and other products bring a smile to your heart and are something you can enjoy with others in your life.